TRIZ is the Russian acronym for the Theory of Inventive Problem Solving invented by Genrich Altshuller and developed from 1948 to 1998. 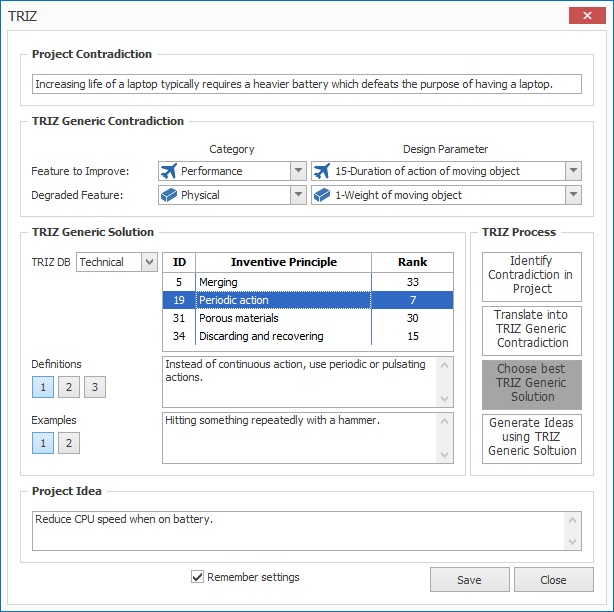 TRIZ is a method for generating inventive solutions to conflicting engineering requirements. Although there are many techniques for generating solutions or ideas (free association, brainstorming, drawing analogies from other disciplines, futuring, etc.,), TRIZ is the only method that is based on patterns of innovation identified in over 40,000 patents. Solutions to technical contradictions can be obtained by first identifying the technical contradiction and then translating it to a combination of the 39 Design Parameters. From the the Improving and Degraded TRIZ Design Features, the best Inventive Principle is selected. Finally, the TRIZ Inventive Principle is applied to the original technical contradiction. Design Parameters definitions are displayed as enhanced tool tips. 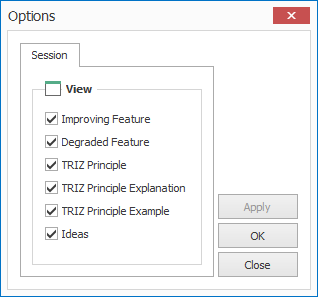 Quickly launch TRIZ Tool from Ribbon Menu. Choose between Technical and Service-based examples and explanations. Triptych TRIZ Tool is useful for generating new Design Options that can be used in Pugh, TOPSIS, and SDI worksheets as well as resolving negative or strong negative correlations in the How vs. How matrix in the QFD worksheet. TRIZ session worksheet information can be displayed or hidden via Option form. This video shows TRIZ Tool using SDI Tools v3 in action. We will be updating this video to reflect changes to SDI Tools v4 soon.